2. 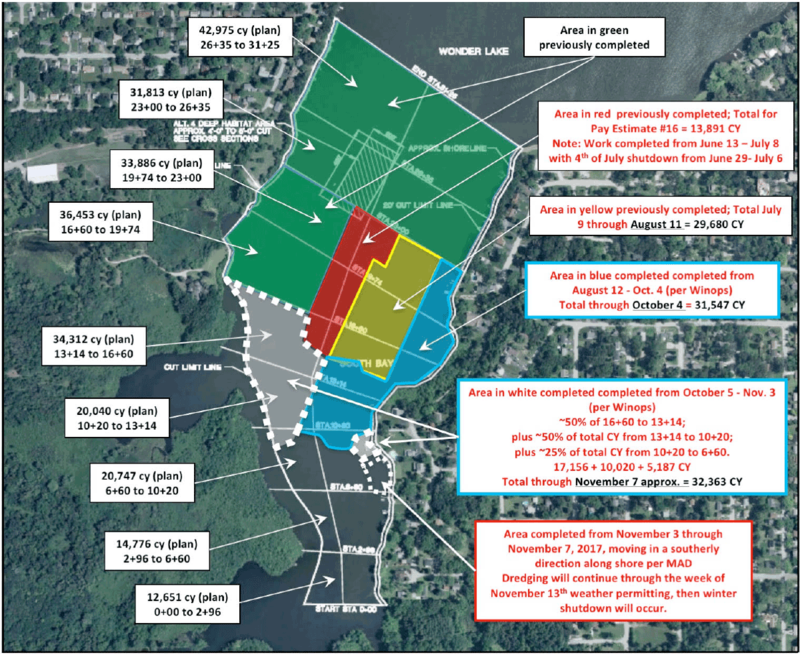 A review of preliminary survey data by the MPOA dredging consultant suggests that the dredging contractor has actually dredged South Bay 0.75 feet deeper than what is called for in the project plans / contract. The MPOA is only required to pay for dredging to the design depth in the plans / contract, so South Bay will be slightly deeper, at no cost to the MPOA. 3. Based on the current weather forecast, the plan is for the dredging contractor to their begin winter shutdown during the week of November 13th. The dredge will be removed from Wonder Lake over the winter for servicing / maintenance, but will return in Spring 2018. It is hoped to get South Bay and the remaining areas at O’Brien Shoals completed as early as feasible in 2018, so that the remaining areas to be dredged in West Bay will be off the main body of the lake. 4. The annual inspection of the Wonder Lake Dam, and the Wonder Lake SDF, was conducted by the MPOA consulting engineers was conducted on Friday, October 13th. No isissues were raised by the MPOA or State engineers who participated. 5. On November 3rd, I made a presentation near Port Washington, Wisconsin on the efforts of the Nippersink Watershed Association to protect the water quality of Nippersink Creek and Wonder Lake. 6. I was invited by the Illinois Environmental Protection Agency to make a presentation in Springfield on November 30th, about how to successfully apply for Section 319 grants. To date, the Nippersink Watershed has received over $ 2 million in Section 319 water quality grants, matched against an additional $1.3 million in local cost-share funding to implement watershed implementation projects that help protect and enhance Nippersink Creek and Wonder Lake. 7. Two Section 319 funded projects were implemented in the Nippersink Creek Watershed above Wonder Lake this fall. Both projects included streambank stabilization to reduce erosion, as well as the planting of native species as riparian buffers. As part of these projects, approximately 80 acres of Nippersink Creek stream corridor above Wonder Lake are now permanently protected.